"The only way to get outside the dualisms is to be-between, to pass between, the intermezzo." "Art is the promise of happiness that is broken." In Between is the art project of EXPO 2000. It takes place amid the buildings and the events of the first world exposition ever to be held in Germany. Faced with the hugeness of the exhibition grounds and the many national pavilions and other structures that dominate them, In Between concentrates on presenting a series of individual projects, located at points around the EXPO 2000 site, that relate specifically to the locales, functions, themes and possible meanings of the event. 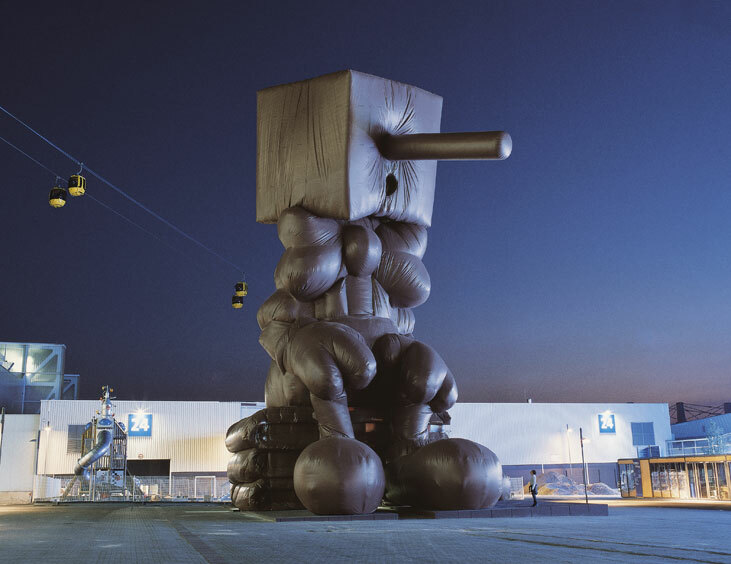 The challenge of bringing contemporary art to an expected audience of forty million people, the majority of whom will have had little previous contact with it, has materially affected the way in which the art projects relate to the fair as a whole. Taking into consideration the history of art at universal exhibitions and the event character of the present enterprise, experimental interventions have been realized that, rather than engendering a coherent overall picture, form a varied constellation of very diverse aesthetic approaches. 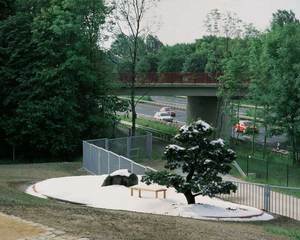 Artists of different nationalities and generations, some with international reputations, others less well known, have carried out individual projects in the entrance zones, planted areas, plazas and other, unexpected locations around the EXPO site. The most readily apparent common denominator among world expositions has undoubtedly been the glorification of technological progress. This has been depicted in an infinite variety of forms, often breathtakingly futuristic and always at the forefront of developments,9 stunning spectators into a state of passive amazement. Benjamins arguments still not been satisfactorily countered. 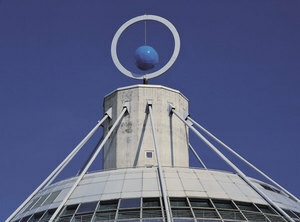 The original alliance among commodity fetishism, fashion-creation and entertainment industry runs like a leitmotiv through the history of worlds fairs and continues to play a key role, a role that the EXPO 2000 art project could not, and did not wish to, ignore. In the year 2000, at a time when the globalization of the capitalist market economy is being accomplished at a rapid pace, the politico-economic function of universal exhibitions would no longer seem to be their most important feature. 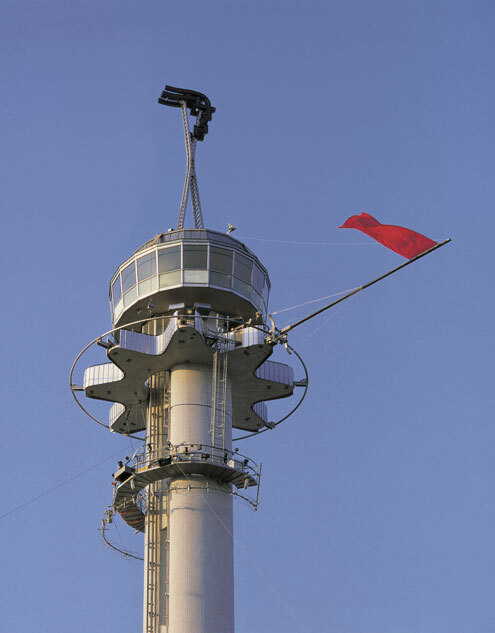 In addition, the extraordinary speed of change in the communications media and the widely accepted assumption that the age of ideologies is over mean that technical inventions no longer need to be introduced at a worlds fair in order to gain wide publicity, represent a nation or impress some ideological adversary. Such developments can only be touched on here, but the more they accelerate, the more the significance of world expositions changes, and in fact may be called into question entirely. 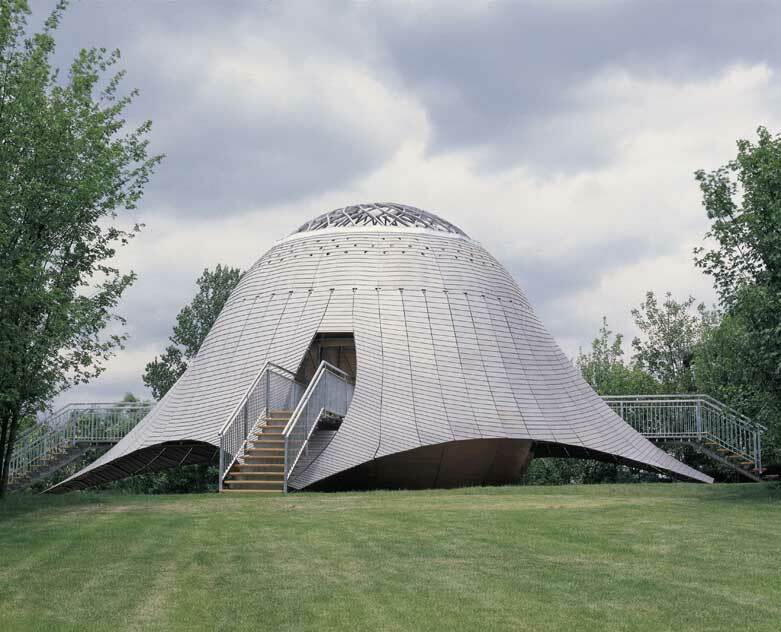 Until shortly before it opened, EXPO 2000, for example, was the subject in Germany of continual debates about its meaning and purpose, its questionable aims and its possible, but by no means guaranteed, raison dêtre. The expositions motto, Humankind Nature Technology, provided an indication, albeit a very general one, of the issues that would be addressed. This trio of terms could be read as a challenge to apprehend and present new technological achievements not in isolation, but in the context of human and ecological responsibility. It is to this responsibility that the central enterprise of the host country, the Thematic Area, is devoted. The very name of this enterprise suggests, however, that its character as an event takes priority over all other considerations. 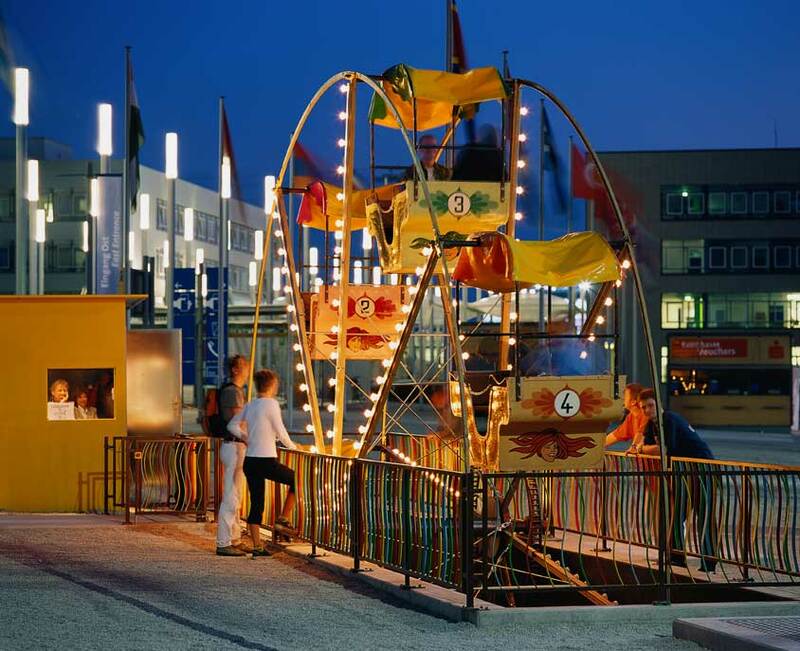 EXPO 2000 was conceived, among other things, as an adventure park, an artificial urban landscape, a hyper-reality within which old or old-fashioned criteria of reality no longer apply, a colourfully staged presentation of joie de vivre and well-being provided for by extensive opportunities for experiences. In this, EXPO 2000 appears exemplificative, in view of the ever-expanding international supply of experiences and the obvious fact that more and more theme parks are emerging, supplanting spaces once known as public. To ask questions about the place of art in a world exposition held in the year 2000 is also to ask about its place in the age of industrially produced experiences.10 As soon as one begins to plan an art project in a context of this type, such questions as to the possible or impossible conditions faced by art in an artificial event space become unavoidable. On every level of conception, production and distribution, In Between has been the story of an opportunity, which we accepted with a mixture of scepticism and optimism. It has been the story of an involvement with a few simple questions. What could the point of the exercise be? What might art represent in this context? What is it doing here at all, in a place dominated by a smooth, uninterrupted sequence of entertainment programmes whose tone is set by the categorical imperative of what Guy Debord calls our society of the spectacle11 Like it or not, enjoy yourself! ?12 Here, desire is subordinated to the superego.13 In the sense that the predominant social reality has become increasingly a lie incarnate,14 it makes sense to speak of events in which nothing happens any more. The trails of adventure have long since changed direction, running, for example, along the path of desiring to be able to desire. What does art expect to find here? Perhaps its function of standing in proxy for repressed urges, which many believe it has lost? Or might art serve as a vehicle for traces of adventure? Or, more modestly, could art at a world exposition perhaps invite experiences more akin to Sigmund Freuds definition of Erleben literally, living through as physically coping with an impression so strong that we were not immediately able to grasp it.15 Could it invite experiences that are never simply confirmation,16 experiences that are, in Jean-Paul Sartres sense, true to life (vécu), in which both the unique moment of personalization and (self-)reflective awareness always play a role? Assuming this to be possible, art would address the singularity of exposition visitors, that point in them where no one can help me or correct me.17 That would be more than desirable. But is art really different from anything else? There is every reason to doubt that it is, and not only in view of the universalization of design cultures, which would seem to have brought about a realization of Joseph Beuyss expanded concept of art in a way rather different from that he envisaged. Within art institutions as well, there is a notable tendency to erase boundaries, to overlap, to practice synergy among non-artistic disciplines. On their quest for new responsibilities, for forms of social linkage and genuine importance, artists are attempting to produce art that is more than art qua art. Even these approaches, however, are unable to escape the immanence of art. And this, in turn, surely lends more weight to the issue of arts specific role as nothing but art. Within a hypermodern scenario in which the latest media would play the starring role, In Between thus looked for projects that employed the second or third latest means and approached traditional art forms and media, including large-scale painting, floor mosaic and sculpture, in such a way that they appeared anachronistically and yet eloquently out of place.21 This might take the form of a structure completely painted pink: Pink Building. Or, at the highest point of the exposition grounds, where the fair symbol is usually seen rotating, of a (mis)placed sculpture. 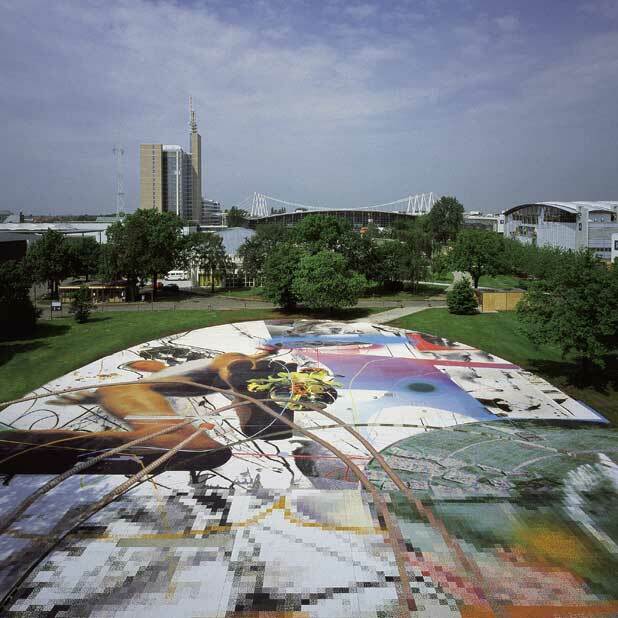 Or of a work composed of six million mosaic tesserae, Bionic Boogie, which inflects the theme of EXPO 2000 in grotesquely personal terms: Ich, Wasser, Technik (Ego, Water, Technology). What we were interested in finding for In Between were inherently compelling individual projects that neither exhausted themselves in hermetic monologues nor were limited to binary-structured dialogues that ultimately would do little more than illustrate theme-park themes. Our aim was to encourage clear, axiomatic visual statements whose configuration would induce open polylogues,22 polyphonies in which the overtones of another voice were heard. This was a criterion of some importance after all, the production of illusory encounters as an ersatz for the failure of the encounter function23 is a constant of the society of the spectacle. What significance does this have for art at EXPO 2000? Perhaps it means that, although art claims the right to be consciously out of place without needing to insist on its autonomy, it can at the same time embrace the risk inherent in responsibility by building visible bridges and thus keeping open the question of the effect on the visitor. Might an art that generates difference not be simultaneously non-indifferent and therefore convey demands for freedom for which it has no mandate?29 This is the age-old, still unresolved question of the relationship between art and morality, the question of the responsibility of form, which I cannot even begin to attempt to answer here. Suffice it to say that In Between raises this question within the bounds of its possibilities or lack of possibilities. Is it too much to assume that mo(nu)ments of irreducible difference might conceivably convey impulses towards overcoming indifference? In Between is neither an art exhibition nor a sculpture park; it does not address a cloistered art world; nor does it regard itself either as art-for-architecture or as architectural art. 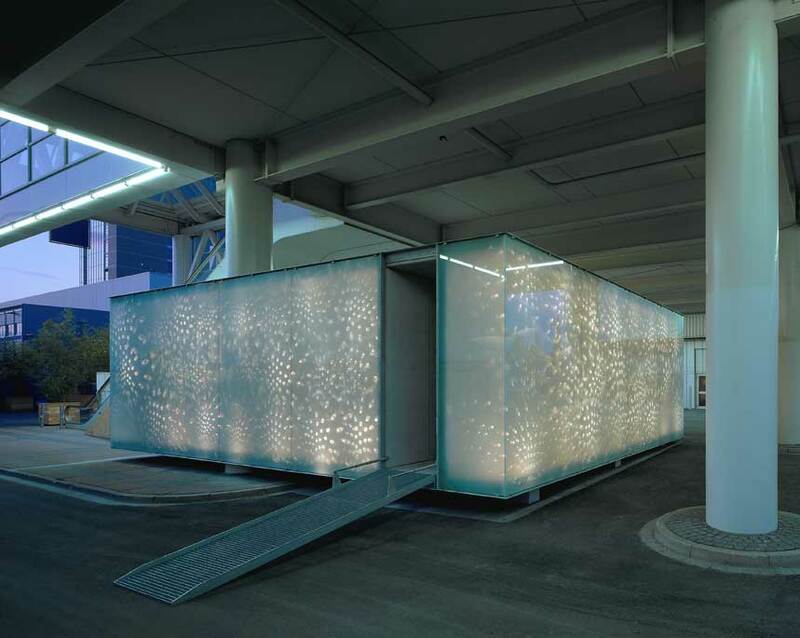 Instead, the art slots itself in between stages and stands, pavilions and halls, technological and cultural attractions, statements of national prestige and corporate presentations. It occupies façades and towers, crosses paths and plays in the intervening spaces. It creates surprising, alternative, in-between spaces of its own,30 which operate in the gaps between current artistic classifications: sculpture, painting, object art, process art, environmental art, performance art, architecture. Its works are interpolated structures, which introduce differentiation to what surrounds them: visual and verbal information streams, omnipresent communication spaces, multiplicity of thematic reference and abundance of available experience. The artists were invited to open up visual and mental spaces, related to the context and site, that did nothing to shape national, socio-cultural or economic identities possible locations for positive non-indifference. Art can also offer something for sale, but it may be something unexpected that alludes to things unsaleable. Art can invite us to ride on a Ferris wheel, but it is a ride with an unknown destination. Art can also wave flags, but they are those neither of nations nor of corporations. The type of outdoor art we wanted was one that, in among the functional structures, would establish areas of the never-before-seen and the does-not-add-up, realms of a constructive deconstructive humour, places where non-identity might emerge from a puzzle picture. In Between does not aim to integrate art harmoniously in the EXPO surroundings. Within the seamless, consonant spaces that are becoming increasingly characteristic of technologically orientated amusement parks it is far more interesting to work with the forms of integration as a means of pursuing disintegration, to employ art to open domains of dissonance that are accessible to all.31 The question was whether this art, as a spatial embodiment of difference, could be realized and perceived as intended within a minutely planned and staged public space. This struck me as quite possible if the spatial embodiment were viewed in active terms, as an act of displacement that created a gap in a finely polished image and pointed up the impossibility of accomplishing a self-sufficient identity in complete conformity with itself.32 In the EXPO 2000 space it made little sense to provide illusions of counter-spaces, anti-spaces, transgressions and infringements.33 Rather, the goal had to be to open gaps and intervals, create disturbances, over-fulfil plans, generate an illusory effect of integration, stimulate expectations to spark off incidents during the performance in an event space, to intervene in an experience. Another potential of art as intermediate architecture can be explained with reference to Michel Foucaults term heterotopia.39 In contrast to utopias, unreal spaces that confront the reality of the here-and-now with the claim of future perfection, heterotopias are actual, charged places in which the real emplacements...found within [a] culture are, at the same time, represented, contested, and reversed.40 Desires, myths, deviations, crises, illusions and compensations can fasten onto these refractory emplacements in an actual place. Gardens, cemeteries, honeymoon trips, parties, carpets, sanatoriums, paintings and ships can be heterotopian places, though not per se. The criterion for heterotopy is a divergence from the political dimension intrinsic to a certain space. A heterotopian place is a displacement or an alternative location in the midst of a socially and culturally defined space, a location that not only represents that space, but also negates, shifts, deflects, dislocates or inverts it a different space within a given, determinate, identified public space. The borderline between these two spaces remains undefined, since we are dealing with a non-transcendent faceting of space in which, for example, heterogeneous, discontinuous, repressed, marginalized, pubescent and other wishes and desires secure a place for themselves. Much suggests that this is the case. Like language, in which there are no pre-linguistic, pre-existent meanings, since meaning arises out of the difference between linguistic signs,44 the public realm, even when defined with radically democratic rigour, possesses no substantial identity. It is marked precisely by an absence of social homogeneity and controlled coherence. It differs from every type of place that is defined by self-identical presence. It is a non-place, in which meanings emerge and vanish in a continuous flux. As one author has put it: The public sphere is structurally elsewhere.45 And it always belongs to others, in the legal as well as the general sense. Wherever it appears, it constitutes an interruption. It does not exist in the form of an area of so-and-so many square metres, though it is real enough. The public realm is a regulative idea, and its enigmatic character as a phantom is nothing but a phenomenon of its elusiveness, its essential openness and indeterminateness. This can induce agoraphobia,46 and not only in the sense that an open space can cause feelings of anxiety, otherness and insecurity that imply a loss of identity, power or terrain. Talk of the demise of the public sphere can also give rise to agorophobia,47 a sense of losing contact with all referential systems or with every assurance (almost inevitably of a basically ideological nature) that the self exists beyond the private realm. When the phantom of the public sphere comes to haunt us, a gulf opens up that Slavoj Zizek has called the abyss of freedom.48 Confronting this yawning chasm is unsettling; but unwillingness to countenance the passing of the public realm into private ownership entails accepting the danger involved. What does this have to do with art? Can art contribute in this sense to an expansion of the public sphere and, if so, what form might that expansion take? Addressing this questionable question was part of the task we set ourselves with In Between. 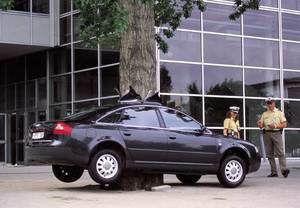 We were fully conscious of the risks involved and the probability of failure. With an optimism belied by the facts, we set out to install ghosts in interstitial spaces, ghosts that would ally themselves with the phantom of the public realm in such a way that their appearance might haunt the experience-drunkenness49 of a happiness-addicted event culture and perhaps momentarily provoke it in the most beautiful fashion. We were aware of the contradictions inherent in an undertaking of this kind and, rather than glossing over them, we decided to face them.50 This in many ways paradoxical situation required us to pass between its dualisms in the hope of being able, at certain points, to create unexpected spaces. Art has more than a choice between negation and affirmation. It is capable of opening up third, fourth, innumerable paths and generating qualities that create, in between the dualisms, surprising intemezzi that have no need of the illusions and cynicism that beset art. Might not EXPO 2000 provide an opportunity for art to unfold its potential for non-affirmative affirmation and non-negative negation? The point was, as it will continue to be, to confront the dubieties and hazards with the nevertheless that is essential to art. 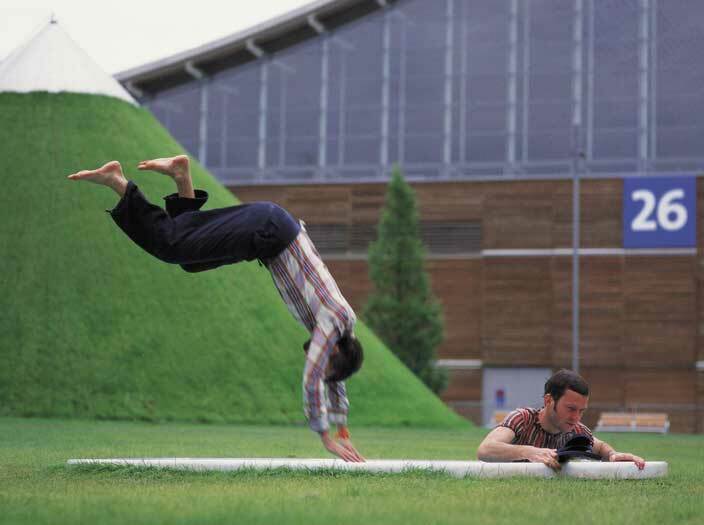 What, in spite of everything nevertheless would art at EXPO 2000 be? What images would it be able to engender, what spaces and what impossible heterotopias would it be able to set up? In what way could art establish itself, parry the situation, without being swallowed up as an indifferent aesthetic ornament? By taking up the declared purpose of EXPO 2000 to present current potentialities that hold promise for the future and diverting this aim in the direction of irreducible difference and the conflicts involved in articulating it, In Between confronted the issues of the (im)possible preconditions of art, its forms of social linkage, its aesthetic volition and its (non-)functions in the year 2000. In view of the diversity of economic and political interests represented at a world exphibition, dealing with these matters was a difficult, if not an impossible, task. But doesnt art develop its possibilities precisely from its impossibility? Adorno, in his day, already understood the aesthetic experience of the non-identical as a possibility promised by its impossibility.51 To regard desiring the impossible as reasonable is one of the central attitudes underlying advanced contemporary art. The In Between project allied itself with this stance.52 Yet was it conceivable or worthwhile to let arts desire for the impossible take visible shape and occupy actual spaces at a universal exposition in the year 2000? Ultimately, the results must speak for themselves. A constellation of heterotopian places of art that take the form of a questioning of their own questionability. An art of the impossible that makes the obsolescence of such an attempt seem obsolete. Might not such issues have found articulation in a series of intermezzi, of intervals among the prestige-orientated statements of a worlds fair? Amid all the spectacle, might not something insert itself, here and there, and turn out to be an immanent difference called art? 1↑ In Between took five-and-a-half years to realize, beginning with the emergence of the idea early in 1995 and encompassing a first presentation of the project to the EXPO 2000 planning committee that April and a detailed presentation within the framework of EXPO 2000 GmbH in November 1995, before the contract could be signed in April 1998. Throughout this period reciprocal influences among the various phases and levels of the project constantly produced surprises and suggested changes that touched upon art and the concepts governing it. 2↑ Walter Benjamin, Gesammelte Schriften, vol. 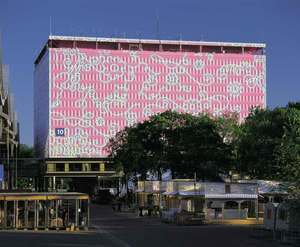 5,1: Das Passagen-Werk, Frankfurt am Main, 1982, pp. 501. 3↑ The title of part of Benjamins book (ibid., pp. 457). 7↑ The entertainment industry refines and multiplies the types of reactive behaviour found in the masses. In so doing, it prepares them for manipulation by advertising. So there are good reasons for the connection of this industry with world expositions (ibid., p. 267). 8↑ See Pabellón Espanol, Exposición International de Paris 1937, the catalogue of the eponymous exhibition at the Centro de Arte Reina Sofia, Madrid. 9↑ Along with the Eiffel Tower (Paris, 1889), the Atomium (Brussels, 1958) is among the most outstanding symbols created for a worlds fair: like no other structure, it evokes the fascinating and fearsome self-perpetuation of technological progress. 10↑ Gerhard Schulze, Die Erlebnisgesellschaft: Kultursoziologie der Gegenwart, Frankfurt am Main, 1992, p. 437. 11↑ See Guy Debord, La Société du spectacle (1967), trans. as The Society of the Spectacle, New York, 1994. 12↑ Slavoj Zizek, Die Nacht der Welt: Psychoanalyse und Deutscher Idealismus, Frankfurt am Main, 1998, p. 9. 13↑ The superego commands one to enjoy what one must do (ibid.). 14↑ Slavoj Zizek, Die brennende Frage: Wach sein ist feige, Die Zeit, 2 December 1999, p. 50. Zizeks text ends with a remark on the continuing relevance of Freuds Interpretation of Dreams (first published in 1900): What appears in the form of dreams, even daydreams, is occasionally the hidden truth, on the suppression of which social reality itself is founded. Herein lies the great lesson of Freuds book. Reality is something for those who cannot endure dreams (ibid.). 15↑ Sigmund Freud, quoted in Benjamin (note 2), p. 508. 16↑ Hans-Georg Gadamer, Wort und Bild: so wahr, so seiend, in Gadamer Lesebuch, ed. Jean Grondin, Tübingen, 1997, p. 176. 17↑ Michel de Montaigne, Essays, trans. J.M. Cohen, Harmondsworth, 1958. 18↑ Theodor W. Adorno, Ästhetische Theorie, Frankfurt am Main, 1973, p. 9. 19↑ See Gilles Deleuze and Félix Guattari, Quest-ce que la philosophie? (1991), trans. as What is Philosophy?, New York, 1994. 20↑ Art holds no opinions. Opinions are a sort of umbrella, which protects us from chaos (ibid., p. 202). The struggle [of art] with chaos is only the instrument of a more profound struggle against opinion, for the misfortune of people comes from opinion (ibid., p. 206). 21↑ A fine example of this is the EXPO 2000 jingle by Kraftwerk. For this and for the issue of the second-latest medium, see Metamalerei: Ein Interview mit Albert Ohlen von Susanne Leeb, Texte zur Kunst, vol. 36, December 1999, pp. 537. 22↑ Jacques Derrida, in his La Vérité en peinture (1978; trans. Geoff Bennington and Ian McLeod as The Truth in Painting, Chicago and London, 1987, p. 10), mentions a polylogue of n + 1 voices which happens to be that of a woman. We would not object if In Between were to possess an affinity to such polylogues. 24↑ This involves something seen adopting the vantage point of its perception that moment when a work of art opens its eyes, so to speak, and looks at the viewer. For discussion of intensity without transcendence, of the non-metaphysical presence of form and the moment of fascination, see Georges Didi-Huberman, Ce que nous voyons, ce que nous regarde, Paris, 1999; Gadamer (note 16); Jacques Lacan, Was ist ein Bild?, in Le Seminaire de Jacques Lacan, vol. 11: Les Quatres Concepts fondamenteux de la psychanalyse, trans. Alain Sheridan as The Four Fundamental Concepts of Psycho-analysis, London, 1977; and Wilfried Dickhoff, After Nihilism, Cambridge, Mass., 2000. 25↑ In his Ein Plädoyer für die Intoleranz (Vienna, 1998, p. 76) Slavoj Zizek describes multiculturalism as a form of its opposite, as the massive presence of capitalism as a global world system, and finds in it traits of a self-referential form of racism (ibid., p. 73). 26↑ People look for themselves and each other in their un-condition of strangers. No one is at home with themselves. The memory of this slavery brings humankind together. The chasm of difference between ego and self, the non-conformity of the identical, constitutes a fundamental non-indifference with respect to (other) people; Emmanuel Lévinas, Humanisme de lautre homme, Montpellier, 1972. 27↑ This raises the issue of morality, which Jean-Paul Sartre, in his last conversations with Benny Lévy, saw as the obligation that, as an inner demand, impels and accompanies every lived experience and all awareness. Sartre, like Lévinas, assumes an awareness of others (Über Hoffnung und Moral: Ein Gespräch mit Benny Lévy, Freibeuter, vol. 4, 1980, p. 48) and thus again raises the issue of a morality that, guided by notions of reason, runs counter to a more generously conceived, individual notion of the general. 28↑ The title of a book by Julia Kristeva: Etrangers à nous-mêmes (1988), trans. Leon S. Roudiez as Strangers to Ourselves, London and New York, 1991. 29↑ See Sartre (note 27). 30↑ Such a space might be, say, that between a monument and the urban realm of sign circulation. Of interest in this connection is Félix Guattaris concept of the signe du signe, a potentiation that creates a gap between signs. Might a visual art that produces gaps of this kind create intervals in space that carry overtones of other compositions of (hyper)realities? In just such an as yet unrealized music of reality Paul Virilio recognizes a requirement of our social survival: With this concept of intermediate space, empty space and built-up space, we touch upon something on which my work has always been based: an involvement with speed....The only art in which speed is treated sparingly is music. As long as speed is not treated as economically in society as it is in music, the problem of the acceleration of the here-and-now will not be solved (Paul Virilio, Didaktische Lektionen, Ostfildern-Ruit, 1996, p. 97). 31↑ On this, see stadtmotiv*: 5 Essays zu Architektur, Stadt und Öffentlichkeit, Forum Stadtpark Architektur, vol. 99, Vienna, 1999. 32↑ See Mark Wigley, The Architecture of Deconstruction: Derridas Haunt, Cambridge, Mass., 1993. 33↑ Even when one stands outside the law, one still remains within its sphere (ibid). 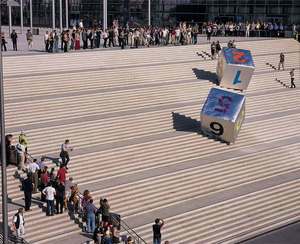 34↑ As a member of the EXPO 2000 planning committee for five years (19959), I had the opportunity to participate in and observe the conception and planning of the expositions overall design. A great many ideas and concepts were discussed and tested. Many of these had ultimately to be rejected for purely pragmatic reasons, as unfeasible. On the other hand, we were able to prevent the realization of numerous questionable concepts, many of them of a contrived artiness. 35↑ Sharon Zukin, Landscapes of Power: From Detroit to Disney World, Berkeley, 1991, p. 232. Zukin describes the worlds fairs in Chicago in 1893 and in New York in 1939 as multimedia predecessors of the imaginary landscape of Disney World, since they share four attractions in common: Amusement parks and rides, stage-set representations of vernacular architecture, state-of-the-art technology, and a special construction of an ideal urban community (ibid., p. 225). 36↑ Michel Butor, Die Stadt als Text, Vienna, 1992, p. 27. 37↑ Zukin (note 35), p. 232. 38↑ Dan Graham, working in another area of the gap between art and architecture since the 1960s, has described the phenomenon thus: the artwork does direct attention to the seams in various representations (revealing the conflicting variety of ideological readings). To do this the work uses a hybrid form, one which partakes of multiple layers of meaning: the popular code of entertainment and a theoretically based political analysis of form; and, finally, the code of information alongside the esthetically formal. Somewhere between art and architecture, this hybrid form comments on the situation of both (Dan Graham, Two-Way Mirror Cylinder Inside Cube and a Video Salon, exh. cat., New York, Dia Center for the Arts, 1992, p. 54). 39↑ Michel Foucault, Different Spaces, in idem, Aesthetics, Method, and Epistemology, vol. 2, ed. James D. Faubion, New York, 1998, p. 178. 41↑ Architecture where desire can live: Jacques Derrida interviewed by Eva Meyer, in Kate Nesbitt, ed., Theorizing Architecture, New York, 1996, p. 149. 42↑42 For more on this, see Walter Grasskamp, ed., Unerwünschte Momente: Moderne Kunst im Stadtraum, Munich, 1992. 43↑ See Rosalyn Deutsche, Evictions, Cambridge, Mass., 1998. 44↑ An insight we owe to the linguist Ferdinand de Saussure. 45↑ Thomas Keenan, Windows: Of Vulnerability, in Bruce Robbins, ed., The Phantom Public Sphere, Minneapolis, 1993, p. 135. 46↑ Agorophobia is the title of an essay by Rosalyn Deutsche in her book Evictions (note 43), pp. 26971. 48↑ See Slavoj Zizek, in idem, ed., Mapping Ideology, London, 1994, pp. 133. 49↑ Martin Heidegger, Gesamtausgabe, Part Three: Unveröffentlichte Abhandlungen, vol. 65: Beiträge zur Philosophie (Vom Ereignis), Frankfurt am Main, 1994, p. 139. Heidegger regarded the Erlebnis-Trunkenboldigkeit (the state of being drunk with craving for experience) characteristically induced by the entertainment industry as a high point of nihilism, with its organized shutting of eyes in the face of human beings lack of goals, the ready for action stance with which every decision to define a goal is avoided, the fear of every area of decision and of entering it (ibid.). 50↑ Actively pursuing dualisms is a way of rethinking criticism. This thinking...lets the (non-positive) affirmation posited by all criticism and negativity appear through aporias (Jacques Derrida, Auslassungspunkte: Gespräche, Vienna, 1998, p. 361). This comes close to what I understand by parrying (see Dickhoff [note 24]). Derrida (p. 35) describes it as a kind of non-passive endurance of the aporia as a condition of responsibility and decision-making. 51↑ Adorno (note 18), p. 205. 52↑ Rosalyn Deutsche concludes her essay Agoraphobia with an invitation to art to intervene in the public sphere: When art intervenes in the forms of representation through which subjects construct themselves as universal and flee difference, should we not welcome it along with art involved in new social movements as a contribution to the deepening and extension of public space? Especially if we hope to prevent the conversion of the public sphere into a private possession, which is so often attempted today in the name of democracy (Deutsche [note 43], p. 327).